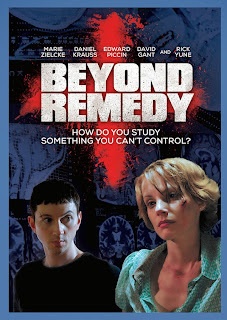 Plot: Product Description: Therapy is deadly serious in the thriller Beyond Remedy. When a group of medical students are invited to participate in an alternative therapy study dealing with phobias, each student must face their personal fears head on in order to be cured. Who would have imagined that death is lurking just around the corner? A killer, targeting the students, has tailored each of the killings to a specific phobia with spectacularly terrifying results in Beyond Remedy. Surprisingly I had never heard of this film until seeing it on the scheduled films to be released by Olive Films. This is an interesting film of equal parts old-school horror and equal parts suspense mystery. I found myself really enjoying this film with it's low-budget quality, creepy tones, haunting moments at times. A group of six people who have fears, deep fears that are controlling them, come together for therapy. Not just any type of therapy. They each sign up to have therapy in a different way, a different style. All six come to an abandoned hospital for therapy. Professor Gingrich and Dr. Lee have created therapy in an extreme form, facing your fears head on with intense dramatic and fearful ways. An interesting horror film that uses the ideas of fear. These six persons have deep dark fears that control each of them. The process of the therapy is leading each of the persons into a path of their fear. In the hospital, the persons are sent into fear induced settings to try and make them face there problem. Great specials effects and makeup. Even if at times over the top and wonderfully cheesy. The movie is very different. At times it’s a thought provoking ordeal in the fear of persons, and at other times it comes across as a simple low budget horror film. At times the acting is solid and other times, a little over the top and melodramatic. This is a foreign film from Germany, but the language is in English, some parts dubbed, or at least I think they are. Your main female lead Julia is played wonderfully by Marie Zielcke who is haunted by her dead brother. Or at least her living nightmares. Her fear is of knifes, but her main fear is the memory of her brother. Each of the six have a deep set of fears from heights, claustrophobia, darkness, fear of looking into a mirror and others. This was directed by Gerhard Hross. This is his first feature length film. He has done a TV movie and two short films but this is his first feature film. I feel he was able to capture a nice sense of dread, and horror in this film. The first half of the film is solid and flows with ease. The second part turns a 360 and ends up going into a cheesy reality that takes away from the story but still holds the viewers interest. The movie does have its flaws, over acting at times and filled with all the clichés you would expect in a horror film. Solid beginning and then spirals into a cheesy B-movie. Great makeup and gore. The biggest flaw is the final show down, when the truth finally comes out. The whole ending is silly and why over the top, but for a low budget B-movie what do you expect. It’s still fun entertainment of the popcorn style. The best way to describe this, if Roger Corman and Robin Cook had a love child, it would be Beyond Remedy. Also starring veteran actor David Gant as Professor Gingrich. A constant performer throughout the years. Always able to capture his characters in a deep understanding of the roles he plays. The hospital itself has a sinister past adding to the terror that each person faces. Is it therapy or is something more horrible happening. The mystery unfolds in twisted, believable low-budget form. This has all the wonder of a Drive-In B-grade horror film, with an interesting plot. Olive Films did a great job bringing this out on their Martini Entertainment title. The movie is pure, simple, cheesy horror, that works in the Drive-In form. The sound quality is perfect. No flaw whatsoever in this department. Same with the video. The audio and video are both flawless on this DVD. Great sound effects. Vibrant rich color. The tones come off in an excellent form. The DVD by Olive Films aced this department of the product. If you love low budget entertainment. Popcorn junkie films. B-movie horror, then this is a golden ticket. A wild interesting film with solid makeup and bloody, gore, violence. Simple plot, cheesy conclusion but yet oh so perfect, for the fan of B-grade entertainment. Pure old-school 80’s style, Direct to Video, Slasher Horror. Corny, cheesy, drive-in, over the top, oh so weird in a popcorn style entertainment. Go into this wanting a simple low-budget horror film with over the top gore, moments that make you laugh in how a victim can still be alive after having his neck and windpipe busted, is just a priceless B-movie, with B-quality perfection. Olive Films did a fantastic job bringing this to the fans of this style of entertainment. I recommend it for fans who love this style of low budget horror. I was entertained with all it’s over the top and ludicrous moments, and that’s all I really ask for.